Canadians celebrate their national day on July 1 each year to mark the enactment of the British North America Act in 1867. This used to be called Dominion Day. I’m using the time of 00:00 hrs in Ottawa as per Nicholas Campion . This Dominion chart looks to work well when looking at major events in the history of Canada. Below are the transits to the Dominion Horoscope from one major event which shows the accuracy of the chart. The event was the École Polytechnique massacre on December 6 1989. An anti-feminist massacred fourteen women then killed himself. The killer entered to college class at 5:10 pm (see chart). Precession correction value = 102′. Lunar Eclipse conjunct Moon – Public mood strongly influenced by emotion, need for basics, security, womens vote may be decisive. 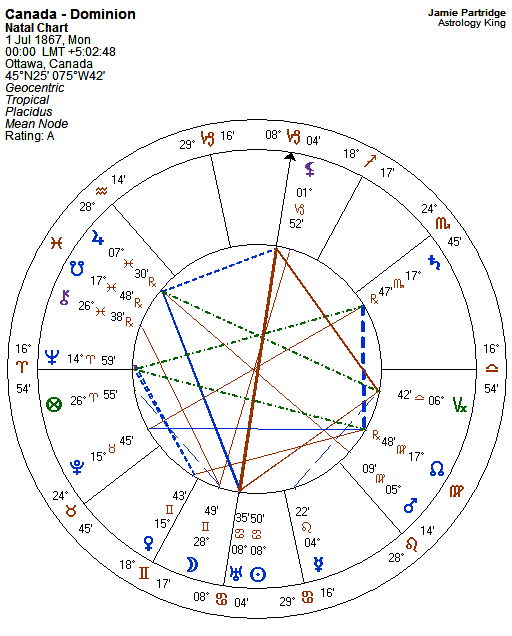 Pluto trine Mars – Favours aggressive stances on foreign policy, chest beating nationalism. Saturn square Sun – Not favorable for the current PM. Mercury conjunct Neptune – Lies and deception. Oh what a surprise for an election! Wow! you could not have been nmore wrong about the election! Steven Harper won hands down! I think the chart with the Libra ascendant should be considered. To me it seems to be a better fit. For one, The fifth house Jupiter could be indicative of our abundance of creative, entertaining people. And we are a lot more like Cancer MC in behavior and the way we have been perceived in the world (before Harper). Possibly our eleventh house mercury gift could be our many comedians and writers etc. Of course this all depends on what house system is used. We have a ninth house sun which is conjunct Uranus keeping us open to change and new ways of looking at the world. Also having freedom of religion in our charter of rights. Our tenth house moon shows how we are always ready to help anyone and are perceived that way by the rest of the world as well. (again before Harper) The eighth house Pluto could be our abundant and dangerous resources, ie: asbestos, uranium, the tar sands that are polluting huge amounts of clean water and killing wildlife in tailing ponds. The annual seal kill etc. What do you think? It is a better fit because it is accurate. Canada was signed in as a country at 12pm. Midnight has absolutely nothing to do with it. I took another look at the chart and see that the balsamic moon is actually in the ninth house but rules the MC. I think we are more like a Cancer moon, and the Uranus Sun conjunction fits too. The paperwork that was signed making Canada a country was done at noon on July 1st. I am afraid that the information you have regarding this country is off base. 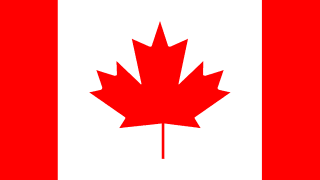 Libra in the ascendant means that the Canadian political focus has always been in partnership with other countries. The charm, grace, balance that has been the hallmark of the culture is the means used by politicians to get what they want. Everything is explained if you use noon as the time of demarcation. Check when a government is sworn in and you can tell how they will run the country. Use Mercury in any mundane chart to find important agreements signed and released to other parties/countries. It is the movement of Mercury that is highly significant. Note the house/sign that Mercury is in when negotiations start, follow it through retrograde, back to stationary, and you can tell pretty exactly what is being done and how it will effect the people. I have done this with Canada, Isreal, the Vatican, UK, Indonesia and a few others. Never fails. These days, especially since the Grand Square it has been truly frightening. Please note that Canada was not born at midnight, but at 12:00pm. July 1, 1867. Thank you from a once proud Canadian.